I can’t stand the thought of going from one audio podcast to the next (coming soon) without a food post in between. Admittedly I’ve had twenty bazillion things published at the Reader, Serious Eats, whatever, so it’s not like you can’t hear all you want of my voice and more. But I don’t really review at the former (except in the sense that you can tell what I think sometimes, unabashedly), so here are some things I’ve eaten recently, all fairly modest. Let’s go! Gogi. New Korean BBQ place in the former Hai Woon Dae space, which looks completely classed up and transformed to me, though Mike Sula says the layout is the same and it just got a snazzy black paint job. What’s not the same is that this is a definite step up in ambition compared to other Korean BBQ joints around town, the quality of meat being on par with the superior cuts at Chicago Kalbi, and the variety better than that (and better than pretty much all the others, with their standard repertoire of kalbi, bulgogi, and maybe a little chicken or octopus). My favorites were the galbi (beef) and dwaeji galbi (pork ribs); pork belly, which is cooked on a platter rather than over the flame, was more like getting a side of bacon with the meal, but did come with fried kimchi (which was sort of like getting hash browns with it). Also a big improvement: the service, which takes an active role in at least starting the process of cooking your meat. 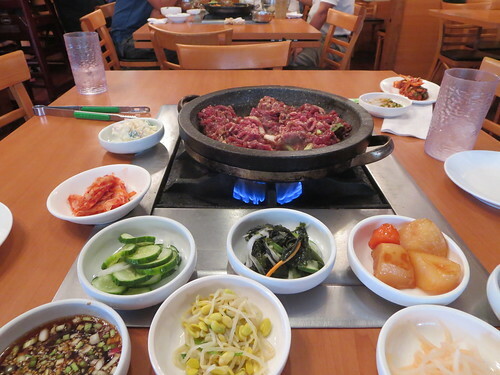 Which is helpful with things you might not know how to cook like the meat that’s attached to bone; the family who opened Gogi, who own the bar next door, are eager to please and handle that for you. 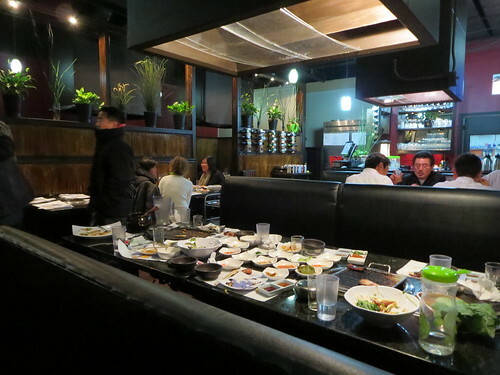 Though you’re there for meat, among the side dishes I really liked both the gyeran jjim, a kind of Korean souffle, and the seafood haemul pajeon (pancake); on the other hand I found the steak tartare (yukhoe) bland and would spend that $18 on more grilled meat instead. The grilling, incidentally, is done by a gas-charcoal hybrid (unlit charcoal dumped on a grill which fires it with gas), which maybe takes a little longer to heat up but works well enough. I’m just happy to see real charcoal Korean BBQ, which has seem a slowly endangered species, making an exciting comeback. 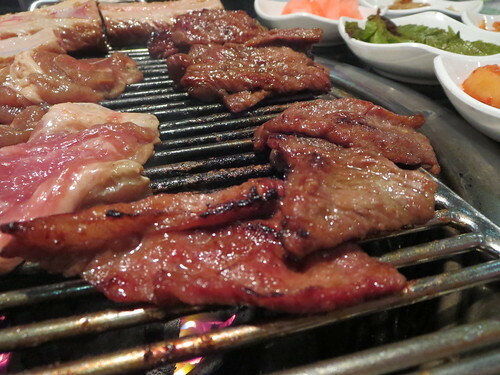 Galbi (beef) and dwaeji galbi (pork ribs) on the grill at Gogi. 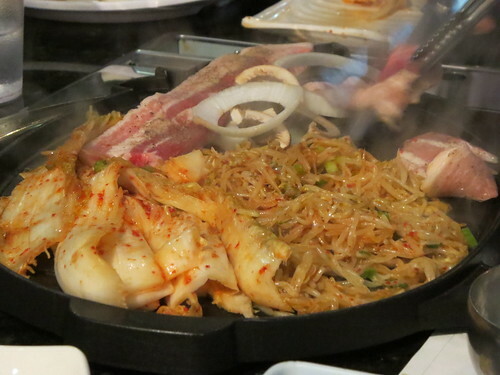 Pork belly, samgyeopsal, cooked on an iron skillet in the shape of a pig, at Gogi. Grill at Cho Sun Ok.
Cho Sun Ok. Another venerable Korean BBQ spot which apparently got a fixup recently is this Korean restaurant on Lincoln, which has been around long enough that Calvin Trillin mentions it in one of his early 70s essays on food (he was taken there by the late U of C linguistics professor James McCawley, a proto-chowhound who sadly died in 1999, just before the internet exploded with food). They don’t cook with charcoal, but their setup is interesting nonetheless, with tabletop grills made of the same kind of heavy pottery as dolsot bibimbop is cooked in; they’re used after some dishes to fry rice in the crunchy residue of the meat. Most tabletop gas grill experiences have been kind of wan by comparison to charcoal places, but I liked it better than I thought I might, and it’s crazy that I hadn’t tried it till now. Service was a little harried, but nothing a little patience couldn’t handle. 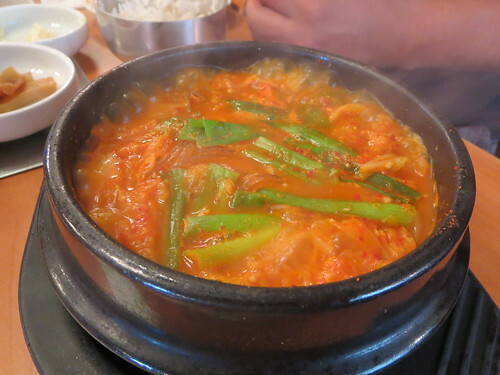 Kimchi stew (kimchi jjigae) at Cho Sun Ok.
Silom 12. So many kind-of-upscaled Thai restaurants open up that are of no great interest— or so we assume; who knows? I ignored this Bucktown spot (in the old Cafe Matou location, no less) until my friend Charlotte ordered from it via GrubHub and praised the wok hay of the Pad See Eiew. Frankly, not sure what that even means, but it was good enough for me to order the same way some night. I really liked everything I got, not only because all of it was pretty good in a Thai funky way, but because it was just different; I love the classic Thai places we all discovered on LTHForum back in the day but it’s been a long time since I had anything new from any of them. The dish I liked the best, frankly, was the one I thought I was ordering to have something basic for the kids to like. They neglected to mention that “Pineapple fried rice” was also “calamari and other kinds of seafood fried rice,” but it had good seafoody funk and, all in all, I’d put it up against the best thing I had at Mott Street, their crab brain fried rice. An orange chicken dish put some respectability back into that dish (in a way that takeout of the same dish from Lao Sze Chuan decidedly did not), with a bracing burnt orange hint and some Thai depth of flavor; I liked the pad see eiew for reasons that must include its wok hay, and we also had Larb Tod, a ground chicken dish which I can’t remember now but liked. That was all chosen pretty randomly off the menu, so there’s clearly more to explore, and I will. 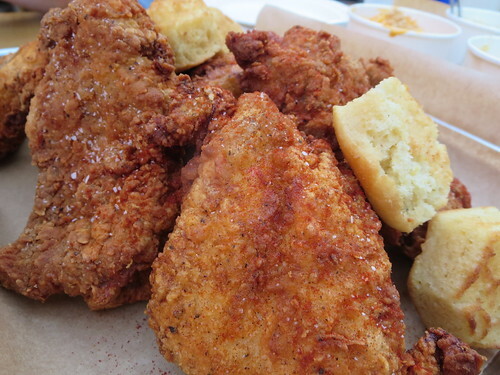 Honey Butter Fried Chicken. There’s been lots of sturm und drang online about the fact that this long-awaited fried chicken place serves most of its chicken deboned; I tried to get basic facts and the owner’s perspective on why they do it that way out in this piece but it rages on. Here’s my basic feeling: yes, fried chicken should have bones, but it’s a big world and it’s not going to kill you if one place does it differently. 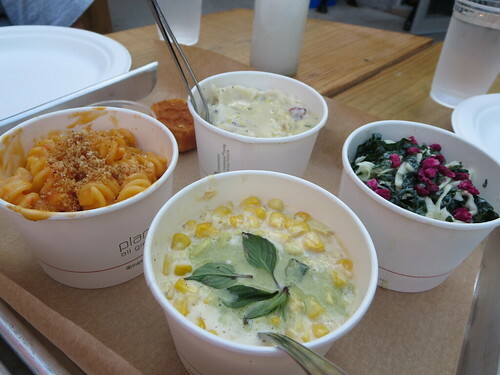 And I really really liked the sides, the corn with Thai curry flavors or the mashed potatoes made with schmaltz. And I liked sitting on the patio in October. And I liked that my kids liked it and we had a good evening together. I’m as much of a nitpicker on certain things as anybody, but you gotta see past the chicken bones for the forest sometimes. What I have to disagree with strongly is the idea, which has come up a few times, that the chicken seems “processed” as a result. No, it seems carefully deboned and brined and breaded and fried, and is in my opinion very tasty… just lacking in the textural variation that a bone gives you. Talking about it as if they’re basically serving you Chick-Fil-A sandwiches minus the bread winds up supporting the sort of people who can’t understand why it isn’t as cheap as it would be from some place that really does use processed industrial horror chicken. Honey Butter buys reasonably humane chicken— Miller’s Amish chicken from Indiana, used by many restaurants in town— cuts and debones it by hand, breads it and fries it with care. If it’s not your thing it’s not your thing, but failing to keep the distinction between that and industrial food isn’t helping the cause of convincing people why they should pay more than fast food prices for better than fast food things. El Pollo Real. Speaking of chicken! The name of course basically means “Chicken King,” but I prefer to think of it as the Pollo Real Deal. 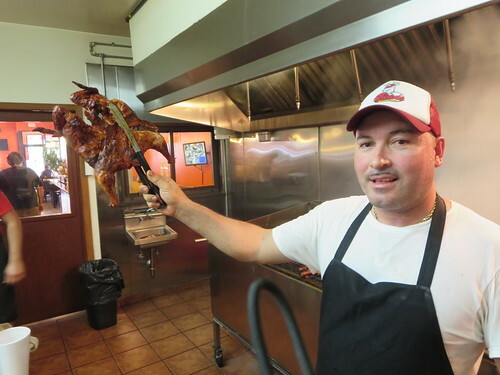 Titus Ruscitti first called it to attention at Serious Eats, and it is, so far as I know, out of millions of Mexican places promising chicken “al carbon,” the only other one in the city besides Taqueria Ricardo actually cooking over live charcoal. * I like black char bits and this was a little lighter than Ricardo for those. 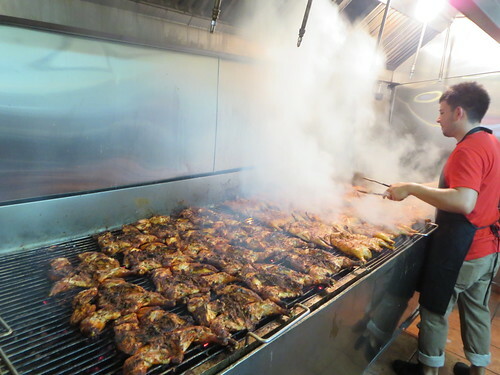 But the chicken was moist and full of flavor (and the air was full of smoke outside), the house salsas are pretty good, and the guys who run it are enthusiastic and happy to show off their cooking setup, so there is everything to like about this place and you should make a trip to Little Village sooner rather than later for it. * Not counting South American places like D’Candela. One eternal question: really good Mexican in that area. 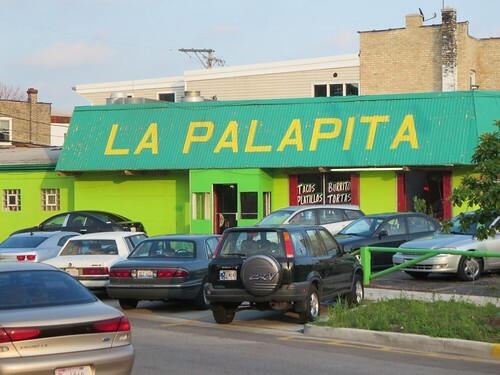 This place looked promising— the name made me think it might be related to a south side place, which was clearly mistaken, though an old post by Titus suggests it might actually be connected to La Pasadita. Anyway, it’s a tallest dwarf kind of thing; the menu is clearly authentic in a no-concessions-to-gringos kind of way, and both grilled steak tacos and a torta were fine without being special enough to rate much of a drive. 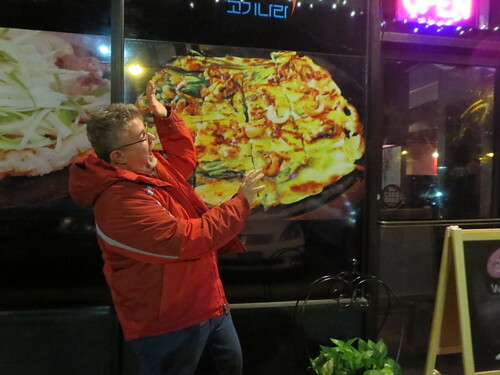 It’ll scratch the itch if you can’t travel further, but I’m still looking for the great northwest side Mexican joint. 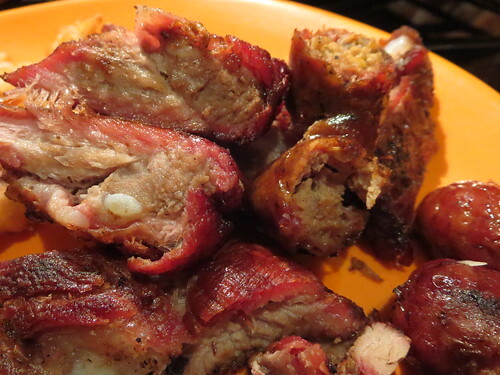 Ben’s BBQ. 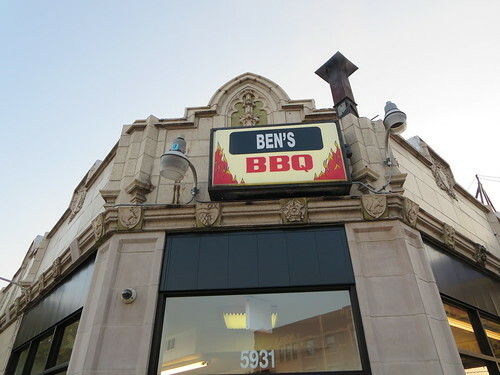 I was delighted to learn that the owner of this place isn’t actually named Ben— that was just a name that was already on it. That’s in the best tradition of south and west side BBQ places, which tend to run through owners till they find the one who sticks and masters the aquarium smoker. The actual owner is a good guy— he came out from behind the bulletproof glass to offer tastes of the ribs to everyone waiting— and with the closing of the original Uncle John’s there was a lot of enthusiasm on LTHForum for this place being the next great Chicago-style African-American BBQ joint. Maybe in six months or a year; what I had didn’t have the depth of smoke of the best ones, and was a bit dried out (admittedly, it also traveled a half hour before I got it home, but I’ve driven others as long). That’s not to knock it, just to say it isn’t in the top ranks with Lem’s, Barbara Ann’s (which is back with a vengeance, though they still can’t do the links like Mack did), Exsenator’s and the others who have been around for decades. Not as good yet, anyway, but I wish them continued improvement and the customers to sustain it. Ms. Biscuit. 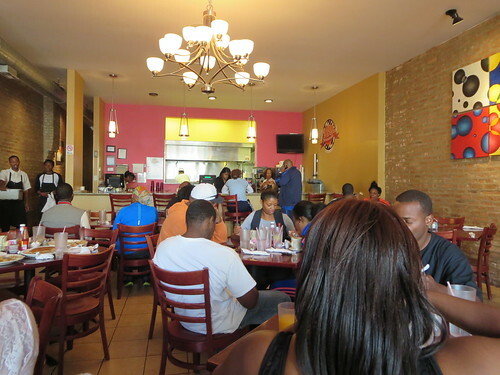 This was a place whose name had registered with me years ago (I think Peter Engler had posted about, maybe even as far back as Chowhound) but I’d never gone, and if I was in that area (rarely), I was more likely to hit Chicago Chicken & Waffles anyway. But it got some recent LTH and Serious Eats attention (the latter by Titus again, who seems inescapable this week), so it was time to go. Now I wish it had gotten the buzz years ago, because with various new places drawing attention for their biscuits, we need a baseline, and these are, by a comfortable margin to me, the best old school biscuits I know of in Chicago, noticeably better than the ones at Edna’s/Ruby’s. (I’m not going to argue about them vs. the higher-end joints, that’s a different animal.) 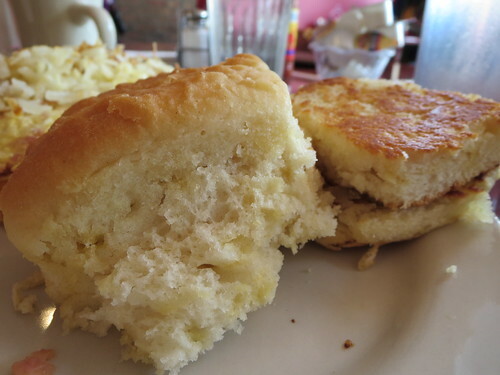 Breakfast is solid and good quality overall, so I have no hesitation about an overall recommendation, but these fluffy biscuits— available grilled or regular, both terrific— are the kind of thing you think you have to go into the deep South to find. No, just south 54th street. One thing though: as you might imagine, it gets busy on weekends. Saturday morning, we probably waited 45 minutes after seating to eat. I don’t want to even know what Sunday after church is like. Good stuff Mike. I’m glad you checked out El Pollo Real and Ms Biscuit too, always nice getting another person who ‘s been around opinion’s on little spots like these bc some can tend to go thru phases and in some cases just switch it up, but that’s half the fun. I’m done with palapita, when they grill their steak to order its good but Ive never seen a place so stingy with salsa. They’d always give one in to go orders, even if ask for two, dont even dare wanting three. Judging by the people behind the counters approach, guessing the stinginess was just bc they were too lazy to have to make more. Too many good spots for that crap. haha. Oh also meant to ask if you’ve been to Mom’s Old Recipe Mexican Restaurant up on Milwaukee out that way? I wanna say Pang did a story about them. Ive been a few times though not since the review which made me want to get back. Its worthy of a stop in a city rich with Mexican food so def worth trying if out that way. Problem is always forget about it unless I’m in the area which isnt but maybe once a month anyway and Im not always hungry when I am. I remember Pang’s article but I don’t actually know where Mom’s is. One reason I haven’t checked out that many Mex places out northwest is that if my kids figure out they’re anywhere near Superdawg, we’re done choosing.